Glucose-6-Phosphate Colorimetric Assay Kit | K657 | BioVision, Inc. 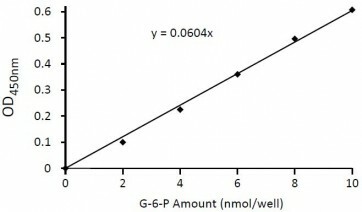 The Glucose-6-phosphate Assay Kit can detect G6P in the range of 1 to 30 nmoles with detection sensitivity ~10 µM of G6P. Glucose-6-phosphate (G6P) is a key sugar intermediate for glucose to get into cells, and then enter either metabolic pathways or storage. G6P can enter the glycolytic pathway, the pentose phosphate shunt or be stored as glycogen or starch. G6P is utilized by its dehydrogenase to generate reducing equivalents in the form of NADPH. This is particularly important in red blood cells where a G6PDH deficiency leads to hemolytic anemia. 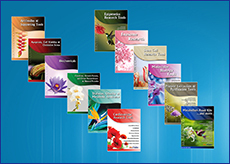 BioVision's glucose-6-phosphate Assay Kit is a simple, sensitive and rapid means of quantifying G6P in a variety of samples. In the assay, glucose-6-phosphate is oxidized with the generation of a product which is utilized to convert a nearly colorless probe to an intensely colored product with an absorbance at 450 nm. 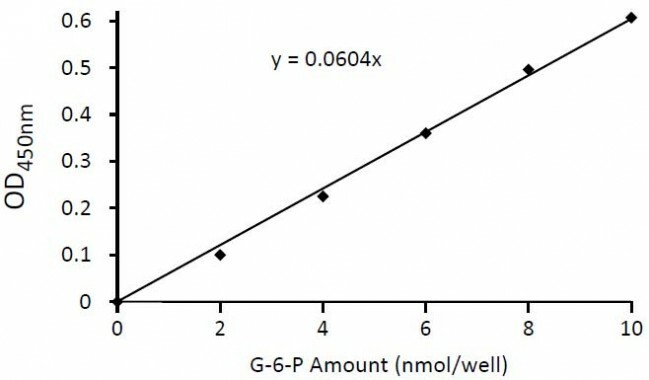 The Glucose-6-phosphate Assay Kit can detect G6P in the range of 1 to 30 nmoles with detection sensitivity ~10 µM of G6P. Does this kit also detect G-1-P? No, this kit is specific for G-6-P since the enzyme at the first step of the detection reaction only recognizes G6P as the substrate. What is the range/sensitivity of this kit? This kit can detect G6P in the range of 1 to 30 nmoles with detection sensitivity ~10 µM of G6P. Fresh samples are always preferred over frozen samples since this is an enzyme activity assay. However, frozen samples can also be used, provided, they were frozen right after isolation, were not freeze thawed multiple time (for which we recommend aliquoting the samples before freezing) and have been frozen for relatively short periods. This kit is good for 12 months from the date of shipment in the unopened form when stored at the appropriate temperature (-20C) and in appropriate conditions. After opening and reconstitution, some of the components in this kit are good for 2 months at -20°C. Please refer to the datasheet for storage information and shelf life of each of the components. Shearer, J. et. al. Exercise training does not correct abnormal cardiac glycogen accumulation in the db/db mouse model of type 2 diabetes. Am J Physiol Endocrinol Metab, Jul 2011; 301: E31 - E39.